Two Virginia legislators were honored by ACEC Virginia as Legislators of the Year at their annual Engineering Excellence Awards Gala on February 5 at the Jefferson Hotel. Delegate Richard Anderson (51st House District) of Woodbridge and Senator Bryce Reeves (17th Senate District) of Fredericksburg, received this award because of their commitment to economic development, good governance and solving the state's transportation problems. "Building and maintaining Virginia's infrastructure and fiscally sound governance are two very important issues facing the state. We recognize legislators who understand these issues and will fight for them in the General Assembly," explained Nancy Israel, Executive Director of ACEC Virginia. Delegate Anderson, the Deputy House Whip, has quickly risen within the House of Delegates and serves as the Chairman of the Science and Technology Committee. Anderson also serves on the Appropriations, General Laws and Transportation Committee's. He received the Virginia Chamber of Commerce's top business score in 2013, is committed to reducing wasteful government spending and is dedicated to finding real solutions to the transportation problems in the state. Senator Reeves currently serves on four standing committees in the Senate. As a freshman he was chosen to serve on the powerful Courts of Justice Committee, the Privileges and Elections Committee, Social Services and Rehabilitation Committee, and the General Laws and Technology Committee. In addition to his committee assignments, Reeves was chosen to serve as the Co-Chair of the Military Caucus. In his short time in the General Assembly, Reeves was recognized by the Virginia Chamber of Commerce for his work and legislation for tort reform and given the Legal Reform Advocate award and the Distinguished Advocate for Virginia Business A voting record. He is known as an advocate for economic competitiveness and transparency in government. ACEC Virginia lobbyist, Patrick Cushing, Esq., presenting the Legislators of the Year Awards at the 2015 Engineering Excellence Awards Gala on February 5 at the Jefferson Hotel in Richmond, VA. 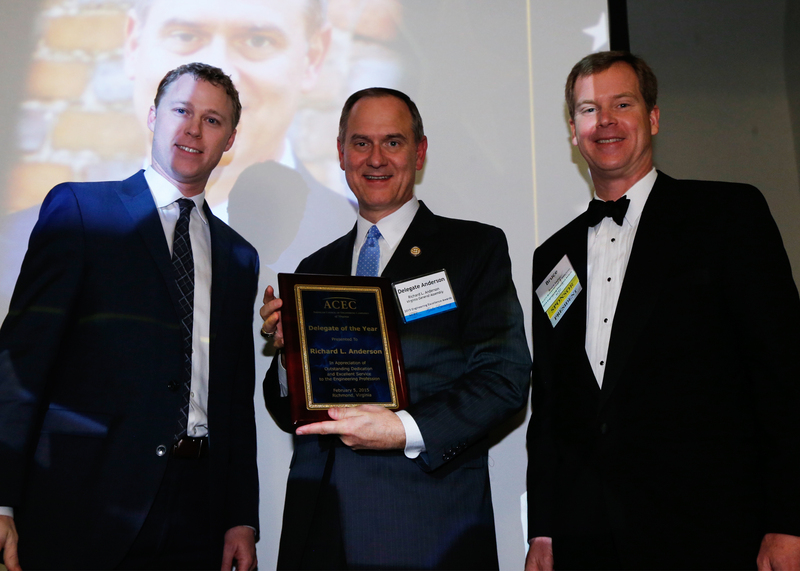 Delegate Richard Anderson accepting his Legislator of the Year Award at the 2015 Engineering Excellence Awards Gala. 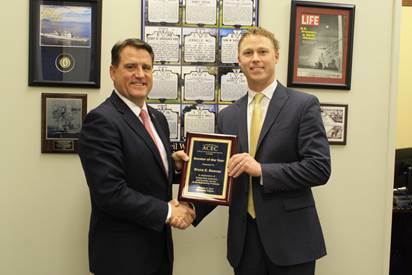 Senator Bryce Reeves accepting his 2015 Legislator of the Year Award with ACEC Virginia lobbyist Patrick Cushing, Esq. of Williams Mullen.